The Curtin Graduate School of Business (CGSB) has an unrelenting commitment to the pursuit of excellence and are committed to ensuring that participants are able to achieve their full potential. Our goal is to enable our students to creatively and responsibly lead sustainable organisations and communities locally and globally. Our programs are delivered by highly qualified and experienced facilitators drawn from the Curtin Graduate School of Business' academic faculty, our adjuncts, visiting interstate and international professors and practitioners in industry. All academic staff have previously held appointments in industry and some continue to hold joint appointments. Our team of dedicated online teaching and learning experts ensure that our programs remain amongst the best in Australia and the world. With a mission to develop leaders who can creatively and responsively lead sustainable organisations, the CGSB is recognised globally for its excellence in integrating social and environmental stewardship into its curricula. The school was founded in 1993 as a semi-autonomous graduate school in the heart of the Perth central business district. In 2002 the school moved into our current premises, the refurbished Government Printing Office. Known as the Perth City Campus, or more commonly as the Curtin Graduate School of Business, we offer state of the art teaching facilities in close proximity to parking, transport, industry and retail outlets. Curtin University is the only West Australian University with a CBD-based campus. Curtin’s Graduate School of Business (CGSB) has won a prestigious national Australian Learning and Teaching Council Award for its Master of Business Administration (MBA) degree. The Australian Learning and Teaching Council citations are the most prestigious teaching awards in Australia. The awards recognise outstanding individual teachers, teaching teams and university teaching programs. The award recognised Curtin’s MBA for its outstanding contribution to postgraduate education and the quality of student learning. The CGSB is one of only three Australian universities with Association of MBAs accreditation in Australia. 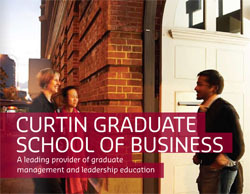 Fill out your details to get in touch with Curtin Graduate School of Business and find out more about their programs.